I live in Nova Scotia’s Annapolis Valley and here people play with their food. And they welcome others to join them. Summer vacation may be over, but in the Annapolis Valley the fun ramps up in October. After several seasons of planting, tending to and harvesting crops and flocks, residents are ready to play. It’s only natural that the so-called “breadbasket of Nova Scotia” and most agriculturally diverse part of Canada would play with and celebrate food. One of the Valley’s signature, truly world-class events is the Giant Pumpkin Regatta in Windsor. The world’s craze for competitive giant pumpkin growing was the dream of local farmer Howard Dill. He developed the Atlantic Giant seed which has sold around the world and fueled this international phenomena. Chef Michael Howell is one of the driving visionaries behind DEVOUR the food film festival. The guys from Sober Island Oysters shuck oysters in the theatre lobby during DEVOUR. These are followed by the world’s tastiest event: DEVOUR, The Food Film Fest. DEVOUR is ground zero for the marriage and many manifestations of art and food. It’s been said that food is first visually consumed, then tasted. DEVOUR puts food on the big screen, then develops special meals based on the film themes. One year, after a documentary on oysters, instead of popcorn and soda, oysters and vodka were served in the theatre lobby. The six-day festival (Oct. 23-28) comprises films, documentaries, seminars, workshops, special meals, galas, receptions and other food-based events like the Bubbles Bus, Street Food Party (from a cluster of food trucks), Mayors’ Bike Ride with refreshment stops, and an Everything Apple Express. Events are held in Wolfville, Kentville and Starr’s Point. In addition to the scheduled events, the Valley offers a variety of other food-related experiences. There’s a weekly Saturday Farmers’ Market in Wolfville (with a diverse range of on-site edibles). Throughout the Valley are pop-up roadside farm markets, with shelves stocked with just-picked, just-pulled from the ground produce as well as home-baked pies, bread, squares and preserves. Many are on an hour-system, so bring cash. In small denominations. Outside Wolfville you’ll find a corn maze and kids playground at Noggins’ Farm, a Pumpkin Maze at Stirlings and fresh cider at Elderkin’s. And from Windsor to Annapolis Royal there are any number of community breakfasts, lunches and dinners based on old recipes and local ingredients. They are real home cooking. Check out Valleyevents.ca. The Valley in fall offers the addition beauty of fall colours with great light for photographers and painters, great tastes and fun things for friends and family to do. It makes playing with your food acceptable. Annapolis Royal celebrates Natal Day by embracing big booms. The town has fireworks, and fills with military re-enactors who face down the heat and humidity or freakish rain at their base camp on the grounds of Fort Anne. They cook on open fires and live the life when this was a centre of imperial power on the Bay of Fundy. When not in camp they re-create one of the battles which took place here. There are volleys of musket fire and the smokey boom of ancient artillery. Annapolis Royal is so pretty, with it’s historic streetscapes of fantastical architecture, lush gardens, great cafes and restaurants, many memorials, it’s easy to forget that this is some of the bloodiest soil in Canada. The French, the English, the Scots, the American Colonists, First Nations – everyone has fought here. And for this one weekend each year we are reminded of who served and died in this bucolic, lush landscape. This year to follow up on the re-enactors noise, Annapolis Royal is hosting a performance of the 1812 Overture. And yes, canons from the Fort will play their part of the performance. The 1812 is presented on August 11th. The performance starts at 7:30. The 200th regatta is a go! The sun in shining in Newfoundland so the Royal St. John’s Regatta is a go! The Royal St. John’s Regatta is the oldest sporting event in North America. This is it’s 200thanniversary. It is one of the quirkiest events in the world. Quirky because it’s a floating civic holiday. While scheduled for the first Wednesday of August it is dependent on good weather. Every year at 6 am the regatta committee – not the mayor, council or premier – determines if the weather is good enough for the regatta to proceed, which triggers a civic holiday in St. John’s. If the weather is bad, the committee meets Thursday to repeat the process and so on. In it’s 200-year history the Regatta has only been postponed a few times: the death of George III, world wars (tho’ in 1941 it was held as a diversion for men at arms and to help with their physical fitness) and because of wind and rain in 2007 and 2008. Some times the weather turns during the regatta. In 1968 the last races ran so late that car lights were used to guide rowers to the finish. Since Wednesday could be a holiday, St. Johner’s party the night before. If the regatta is postponed, they go to work and party again Wednesday night because Thursday could be a holiday. The local joke is never to schedule surgery for early August because you don’t know what state your surgeon will be in. For six nights each summer George Street closes to the public and implements an admission charge to become the continent’s largest pop-up bar. Bands perform on a main stage constructed for the festival and street establishments waive admission charges, create special drinks and provide express service windows. People are allowed to wander the street with drink in hand. It’s New Orleans north. While it sounds raucous, it’s a fun, multi-generational experience. I’ve twice attended the festival. I kick myself for not taking a camera to the first when I saw three university-aged lads wandering the street with an olive-green, velvet sofa. Periodically they would sit it down in the middle of the street and pause for a drink. Other times it could be seen leaning beside the doorway of whatever club they were in. How can you not love a city which hosts such events and is home to such people. Those magical words prompted him to adjust his posture and check his mirror to see if I am a famous face he should know. 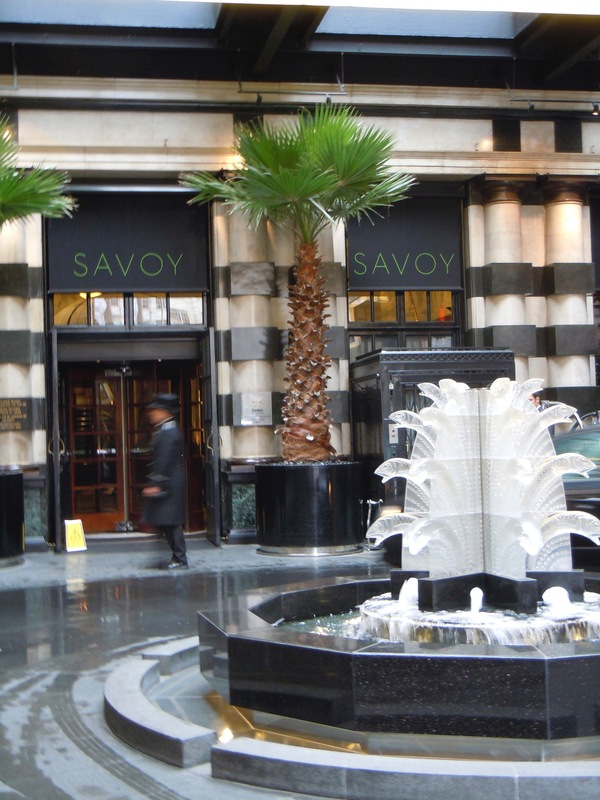 Shortly, we turn off the Strand onto Savoy Court, the short, three-limousine-long lane under the Rolls Royce grill-like awning which protects the Baccarat fountain in the hotel’s forecourt. Most hotels and resorts don’t cost what was spent on the Savoy’s three-year, £220-million renovation, but this was the innovator for modern hotels, everything else is a copy. 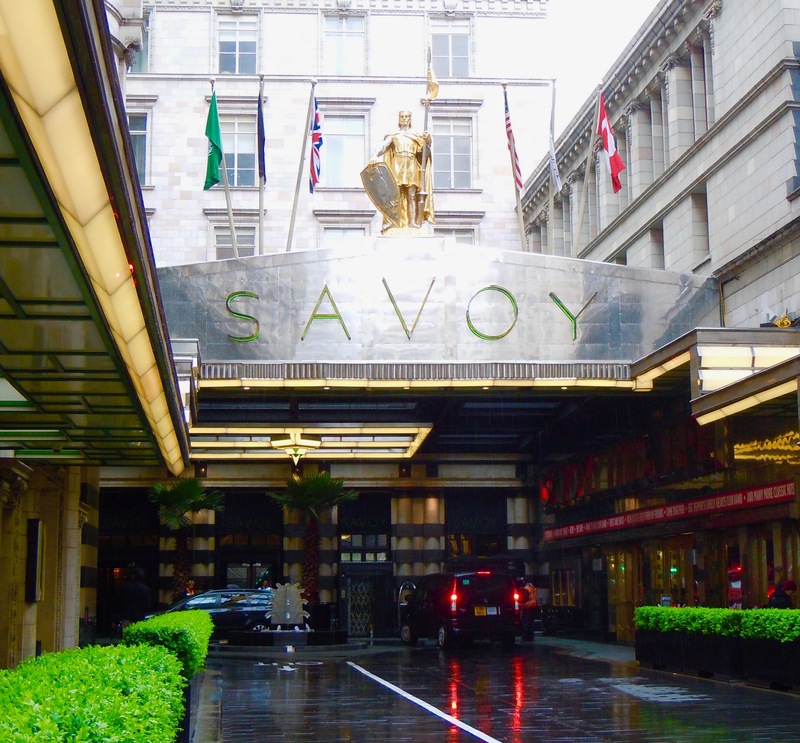 When the Savoy opened in 1889, it was the first hotel to have electricity, private baths, hot water, “ascending rooms” (elevators), air conditioning, and 24-hour room service. Inside the Savoy remains quietly, tastefully opulent. And that spills over to the service, which is not just prompt, but anticipatory. It is as if your thoughts were being read. Staff move with purpose, but without rushing. Nothing beyond the click of a silver spoon against a china cup disrupts the tranquility. 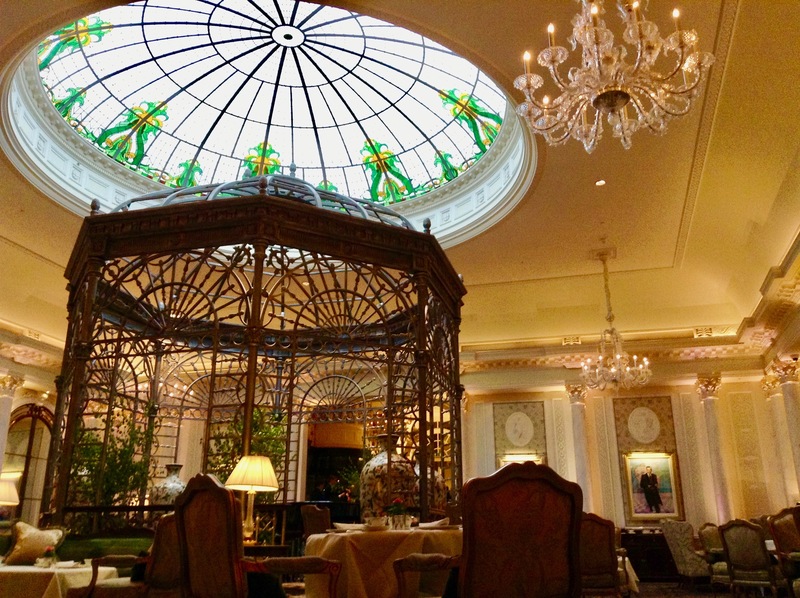 I took tea in the restored Thames Foyer, which is dominated by a rediscovered stained-glass skylight that provides light for the pianist housed in the lacey, licorice-like gazebo below. salmon with dill mustard, Wiltshire bone ham with honey mustard, Egg salad with chives, and Tobiko, cucumber and tomato with basil cream. 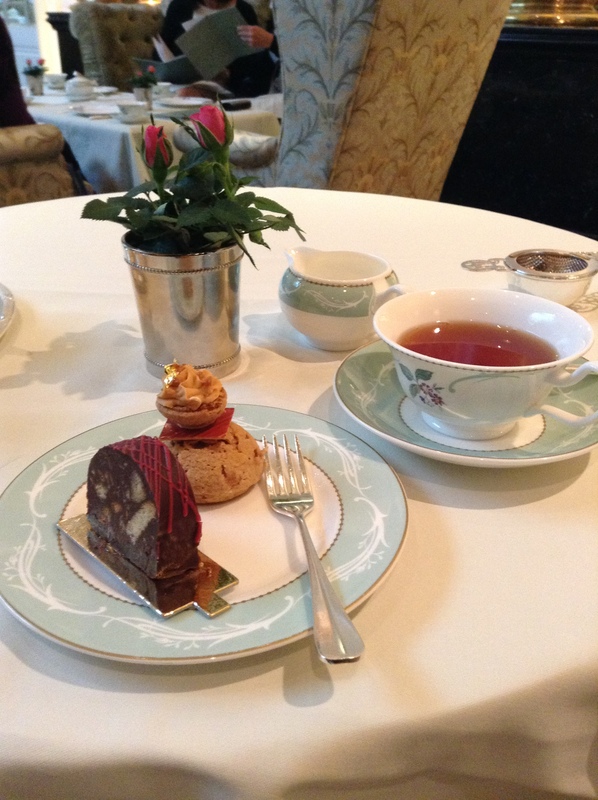 Lest one starve, scones and Cornish clotted cream, followed by French pastries and cakes complete the tea. Tea is so popular that reservations are required. If it’s for a special day, like Mothering Sunday, the sooner you reserve the better your chance of a table. For something more substantial the River Restaurant has been replaced by the stylish and casual Kaspar’s Seafood Bar and Grill, while the famous Savoy Grill remains under the direction of celebrity chef Gordon Ramsay. That other Savoy stalwart, the American Bar, still serves the best cocktails in the empire.